Jonty Stephens as Eric and Ian Ashpitel as Ernie capture the brilliance of Morecambe and Wise in their fantastic homage to Britains best loved comedy duo. 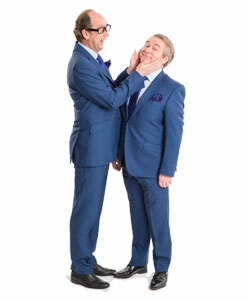 “Eric and Little Ern” written and performed by Ian Ashpitel and Jonty Stephens was first performed at The Edinburgh Fringe, to rave reviews and a sell out run. The show then went on a hugely successful tour, which culminated in its first West End run at the Vaudeville theatre, again to rave reviews and standing ovations. It was nominated for an Olivier award in 2014. Another tour and a Christmas run at the St James theatre, London followed. After putting Eric and Little Ern to bed for a while, the boys are currently developing a concert style show Eric and Ern and performing on P&O’s flag ship Brittania as well as several shows for Warner holidays.